Shion has gone insane. 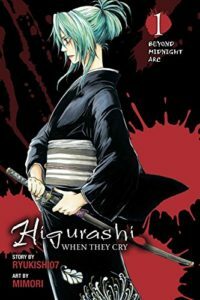 After learning of Tomitake and Takano’s murders the night of the Cotton Drifting Festival, Shion realizes the shadowy forces in Hinamizawa that have been enacting the curse the last five years have struck again, punishing the two for trespassing in the temple’s sacred storeroom, Shion realizes she’s in danger, too. With Keiichi, Tomitake, and Takano, she also broke in. Her paranoia sending her into action, she uses her stun gun to disable her twin sister Mion and her grandmother, the head of the Sonozaki family. Believing all these murders and disappearances happened on the orders of her grandmother, including the disappearance of the boy she loved a year before, Shion is set to get answers. But her elderly grandmother’s heart didn’t survive being stunned. Left with only her sister for answers, Shion will do anything to find out what happened to Satoshi and protect herself. But her actions have consequences. How many more people will die? We are seeing just what happened in The Cotton Drifting Arc. All the weirdness, the manic behavior from Mion, the inconsistencies in Shion’s story, now make sense. Shion was behind it all, swapping roles, manipulating Keiichi and the village to provoke the true killers. Only it leaves so much tragedy behind and draws out a surprising confrontation. This volume is delivering on what the Answer Arcs promise. We’re peeling back the mystery and learning that those we thought knew what was going on may be as baffled as we are. That there is something else lurking in the heart of Hinamizawa that needs confronting. Another bloody scenario is playing out. Will Keiichi, Mion, Rena, Rika, and Satako survive this time, or will we see the same results as last time? The art is gorgeous. It captures Shion’s madness. The story flows as we see her scrambling to react, trying to control the craziness bubbling out of her. All her years of resentment at her family for being shunned, for being put aside for Mion, are exploding out of her. It makes for great reading! 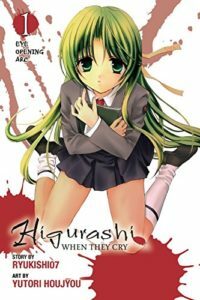 Higurashi continues to excel as a horror/mystery graphic novel series! You have to check out this unique story! You can buy Higurashi Eye Opening Arc 3 from Amazon. If you love the works of Brandon Sanderson, Robert Jordan, George R.R. Martin, R. Scott Bakker, and Steven Erikson, then check out first ever Fantasy novel is out! Boy, we are getting answers now. Confused on what was going on with Mion/Shion in the Cotton Drifting Arc, you will find out in this one. Wondering why Shion freaked out in the Saiguden? Yep, see what’s up with her. This volume picks up a year before the main story where the last volume ended. Satoshi is suspected in the murder of his aunt. To give him an alibi, Shion claims to have been with him to Detective Oishi, forcing herself to reveal her true identity and drop her charade of pretending to be Mion. However, associating with Satoshi, whose family is hated by her powerful grandmother, lands Shion in trouble. Her family has a dark history. They have long been connected with the yakuza. To show her restitution for her actions, and to protect Satoshi from the Sonozaki’s power, Shion proves her contrition by self-mutilation. She has to rip off three of her fingernails. It’s painful to read. It’s horrible to witness her going through such pain. But she loves Satoshi. She will endure it for him. But, as we know, Satoshi disappears. It doesn’t matter that Shion offered up her pain to save him. It festers inside of her. She blames her family for his disappearance while trying to convince herself that he just ran away, a murderer on the run. And then we jump to the present story. Keiichi’s arrival sends Shion’s careful world into chaos and ushers us into the events we witnessed in the Cotton Drifting Arc from her perspective. This is a powerful volume. The fingernail scene is so hard to read. You can feel her pain. The artist captured it well. You see Shion dealing with her grief and this strange presence she feels. That extra footstep we’ve seen from others in this story. Is it Oyashiro? What is truly going on? This volume ends on such a dark note. We’re about to find out just how involved the Sonozaki family is in what’s going on. Are they the culprits, or have they merely been blamed for events outside their control. The story only gets better. The art is wonderful, capturing the emotion between the twins, the anger of Shion, and her pain. It is brought to life in such vivid ink. 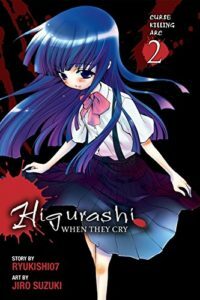 You can buy Higurashi Eye Opening Arc 2 from Amazon. “I dropped my beads in the desert,” the girl wept. The girl searched the desert for a hundred years. “Maybe I didn’t dropped them in the desert, but in the ocean,” the girl wept. The girl searched the seafloor for a hundred years. “Maybe I didn’t drop them in the ocean, but in the mountains,” the girl wept. How many years will it be before she questions whether she dropped them at all? 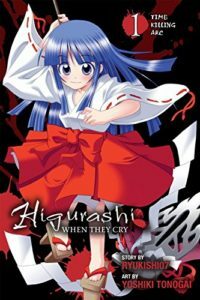 We are launching off the second half of Higurashi. It’s time for the Answers. We pick up in 1982, a year before the main events, with Shion Sonozaki, the twin sister of Mion, escaping from the Catholic girl’s school she’s been exiled to. She’s tired of being away from Hinamizawa. She resents the family tradition of dealing with twins. Her sister is the family heir and to keep her from interfering, the teenager has to stay away. With the help of same allies in her family and the yakuza syndicate they run, she’s heading back home. Conspiring with Mion to hide out in the nearby town, she is dreading when her grandmother, the current family head, finds out. However, bored, she finds herself sneaking out dressed as her twin sister. When she runs into one of Mion’s classmates, Satoshi, love sparks in her heart. Soon she realizes the suffering Satoshi experiences at the hand of his abusive aunt. Knowing her family is behind village shunning Satoshi’s family, she wants to help. But how can she stand up to the head of her family? This arc plays out just like Cotton Drifting Arc save that Shion is the POV instead of Keiichi. The events of that arc hinted that the Sonozaki family is behind the suspicious murders. Shion was captured early on by Mion, held prisoner while she dispensed the family’s justice. With the twins able to pose as each other, the liens of what did or did not happen in that arc were blurred. Now we’ll find out what’s going on. Even more interesting, we get to meet the illusive Satoshi, a youth implied to have beaten his aunt to death for the fourth year curse only to vanish mysteriously a few days later. Did he really kill her? What happened to Satoshi? We’re starting to get answers to these questions as well as see how well one of the three main theories put forward about what is going on is true. 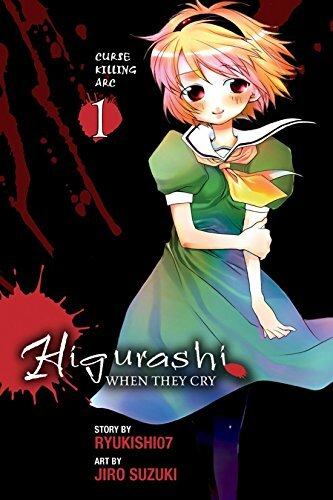 You can buy Higurashi Eye Opening Arc 1 from Amazon. In the ruins of Hinamizawa, twenty-three years after the disaster, a group of strangers realize there is a murder among them. Takumi, the boyfriend of Yae, was found strangled and left in the shrine. Who among them is the killer? Did Otobe really “lose” his friends and how did his cell phone break? Is Mion Sonozaki really who she says she is since she was reported killed in the school terrorist incident twenty-three years ago? Is Ryunosuke really a journalist working on a reporter? Something strange is going on tonight. The dead are bleeding over into the living as the strangers have to reveal their pasts to survive the night. Because they are not alone. Another will is moving against them and if they don’t work together, none will live to see morning. This is quite the exciting volume to read. The mysteries are mostly resolved early, along with showing the supernatural is a real thing in Hinamizawa. Theories are bandied about, giving clues on what may or may not happened to village along with some hints for the Answer Arcs to come. For those who know this series, there were some poignant moments. We’ve seen that these arcs end with at least a few of the main characters dying. Now we get to see the effect the story has on the survivors. There are a few clues to what needs to be done to succeed, a line from the dead that will help ensure the summer of 1983 can be defeated. If you like mystery/horror manga, or those stories in general, Higurashi is one of the best. It’s engaging and intriguing in turns. The art is great in this one. The action is exciting. The characters have to make choices and face the consequences of their actions. You can buy Higurashi Beyond Midnight Arc 2 from Amazon. In 2006, twenty-three years after the Hinamizawa Disaster, a group of strangers find themselves meeting up in the ruins of the city. Each has their own reason for being there. Can they actually even trust each other. One claims to be Mion Sonozaki, a resident of the village; another is Ryunosuke, a tabloid journalist writing a story on the haunted village; Yae and her boyfriend Takumi who just happened to drive out to this village; and Otobe, who got out of the car with his friends to relieve himself only to find them gone when he returned. It’s a stormy night as these strangers gather. Are they telling the truth about their motivation? Is the spirit or entity that caused the mysterious murders in the past still around? Or is it a human agent that lurks in the darkness. Because it is clear that these characters are not alone. Something still haunts the ruins of Hinamizawa. This scenario is a version of The Atonement Arc. We get a tease of what happens in this arc in the talk of a terrorist incident at a school and the students who were killed before the disaster. If you’ve read the series, Mion Sonozaki present won’t be a surprise. There are some other hints to the true cause peppered about. However, if you read this story knowing what is going on, the tension is a little lacking. It’s interesting. The art is drawn in a way to accentuate the tension of the story. The angular look to the characters is effective at the task. It’s several mystery tales all rolled into one and the ending leaves you wondering what will happen next. For an additional arc, it gives you a taste of the Answer arcs to come with those little tidbits that make sense when you know the entire story. Higurashi keeps being an excellent mystery/horror series. The tension builds great in this arc. If you’re a fan of these type of stories, check out this series! 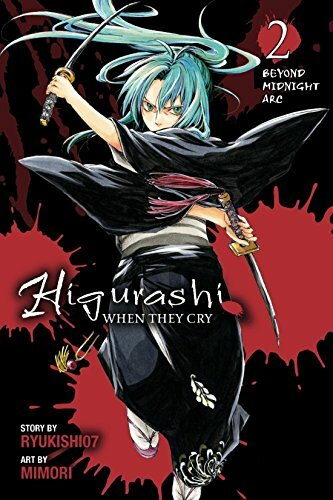 You can buy Higurashi Beyond Midnight Arc 1 from Amazon. Akasaka, a detective investigating the kidnapping of Japan’s defense minister’s grandson, has come to Hinamizawa. The village, protesting the government’s plan to build a dam that will flood their valley, have grown violent. The long shot that they might have kidnapped the kid has paid off. With Oishi, a local cop, Akasaka heads out. He’s about to find that the men who have the minister’s son are not your average citizens. They are armed and dangerous. Will he be able to survive. Rika has already promised that he’ll regret not going home. Is he going to die to save the kid. Well, no, we know he lives. This is him talking to Oishi seven years in the future. So what does Rika mean? What will Akasaka regret? This chapter is intriguing. We have Rika with knowledge of the future. She knows events that always happens, including her own murder. Something is definitely wrong in Hinamizawa. We have plenty of suspects, but the clues are not lining up. This is the perfect ending to the Questions Arcs. We’ll transition to the Answer Arcs and see if our theories match up. The story is poignant. Especially the parts in the present as Akasaka realizes that Rika’s predictions of the future all came true. That this poor girl was crying out for help and he was too wrapped up in his own grief and life to come to her aid. Whatever is going on, Rika is at the center of it. The art is beautiful. The story is poignant. It goes from the action pack fight to the surrealness of Rika. The story is great. It leaves you wanting more. Higurashi continue excelling as an intriguing and engaging mystery series! You can buy Higurashi Time Killing Arc 2 from Amazon. In 1985, two years after the Hinamizawa Disaster, a detective named Akasaka learns that the young child he met seven years ago on a case was murdered in the shrine the night before the volcanic eruption released the toxic gas that wiped out the village. The story flashes back to 1978, when the village of Hinamizawa is in the middle of protesting the dam project that would see their village flooded beneath an artificial lake. A high profile politician’s son was kidnapped and the village’s protest group, known to be violent, is suspected. Akasaka is sent to investiage. There he meets Rika Furude, a little girl respected by the village. Akasaka isn’t happy to be on this assignment since his wife is in the hospital with complications from her pregnancy. He gets to know Rika as he’s given a tour and learns about the village. They seem friendly and he has a hard time believing they could be behind the kidnapping. That is until Rika suddenly begins talking like an adult and warning him that he should leave before he regrets it. She predicts that the dam project will fail within the year and he’ll only find grief if he stays. Undaunted, Akasaka soon learns that his cover is blown and he maybe in danger from the Sonozaki family. Will he stay, or will he leave? This short arc provides a lot of the back story. It shows us there is something up with Rika. She’s shown herself to have a surprising maturity at times in the story, dropping her girlish act. Now we see her giving threats to Akasaka that have the young detective unnerved. This arc has mystery and gives us clues, providing a great transition from the question section of the series and the answer part. We see that the Hinimizawa disaster and Rika’s murder happen in multiple timelines since the Oishi of this timeline doesn’t go missing in the woods while investigating Teppei Hojo’s murder like in the last arc. It’s a hint towards what is going on, though we are still struggling to understand it. There is something evil in Hinamizawa. The question is this: is it Oyashiro’s curse or is there a human culprit working in the background. We’ve had both the Sonozaki family put forth as the human cause, and the curse punishing the wicked on the other end. But the story is murky, and like all good mysteries, nothing is what it seems. The art is great. Young Rika is adorable and the artist captures her childish glee and enthusiasm. It has a mellow story, but the tension slowly builds as new information is revealed, leading us towards the ending driving us towards the ending. What will Akasaka find with Oishi? Higuarshi is an intriguing and engaging series. The characters are likable, making you feel for them when things go wrong over and over again. You are rooting for these characters to survive one of these summers. Will they? You’ll just have to read this series to find out. You can buy Higurashi Time Killing Arc 1 from Amazon. The first volume, we have come to know Satoko. Keiichi’s surrogate big brother relationship was really sweet. But this is Higurashi, and the happiness between the friends can’t last. Doom falls on the gang in the form of the return of Satoko’s abusive uncle Teppei Hojo. A vile man who abuses and degrades her. As Keiichi and his friends want to help the girl, they find out that even the adults in their lives are powerless. Their teacher has done all she can. The government finds no evidence of child abuse. Keiichi becomes more and more desperate as he sees Satoko swallowed up by pain and suffering. And then he remembers Oyashiro’s curse. For the last four years, one person has been murdered and one person disappeared on the night of the Cotton Drifting Festival. Oyashiro, the shinto deity who protects the village, punishes those who try to harm it. So why not Teppei Hojo this year? Not wanting to relay on the nebulous “curse,” Keiichi plans to use the superstition to his advantage. He’ll save Satoko. He’ll murder Teppei Hojo. This is one of the most heartbreaking stories to read. The artist and writer have captured the way Satoko crumbles beneath the abuse, how she tries to be strong, to pretend nothing is going wrong even as she grows more and more dead, wliting. The bubbly, happy, outgoing girl crushed beneath Teppei’s curelty. It crashes into the unfairness of the world. Into the grinding pace of a government bureaucracy. Into the limitations of modern life to defend your neighbors. Keiichi’s transition from student to murderer makes sense. It flows down the path. You’re rooting for him, so it’s so tragic when it all goes wrong. And that ending. That gut punch at the shrine then the “disastor” only makes you have more question. Just what happens in this village? What is going on wrong? Why did the disaster happen this time and not in the last scenario. Mion no longer seems to be in charge of the killings like she was last time. But once again, Tomitaki dies and Takano is murdered/goes missing. Only this time, we get something more with her. Something sinister. For the most part, the art is better in this volume. The style fits the more depressing shift in the story. There were a few times it didn’t work, like with Takano. All in all, this was a powerful story. It leaves you hoping there is a way out for these friends, to survive the summer of 1983. This is the last of the question arcs. Up next is an arc to get some back story and set up the ending, and a filler one that gives us a spooky story set in the aftermath of this arc. 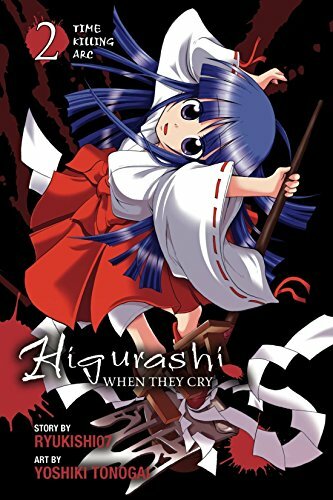 You can buy Higurashi Curse Killing Arc 2 from Amazon. Once again, everything has reset. Keiichi (newly moved to the village three weeks back) has just returned from that two day trip back to Tokyo. Things appear to be playing out the same as the last two times only now we’re focusing more on Satoko. Things have shifted, allowing Keiichi to get to know Satoko before. She’s adorable beneath her hyperactive facade. She’s looking for love, abandoned by her family who have died or vanished. In Keiichi, she’s finding what she lost a year ago when her older brother Satoshi “transferred schools.” Satoshi and Keiichi have a great relationship. The playfulness and bit of sibling rivalry is capture well, along with a level of affection that will inform the second half of this story. As always, Keiichi learns of the villages dark secret and Oyashiro’s curse. Clues are dropping as we, the reader, are struggling to understand what is truly going on. What leads to these “demonic” possession and the friends turning on each other in horrible ways. Beneath it all lurks something nefarious. A woman has been found brutally murdered. The police are investigating. It’s something new to story. Is this the even that triggers off this scenario? How does these events relate. The questions are building and building. The mystery of Hinamizawa continues. Now, while the story is sweet and heartwarming (for now), there’s a problem using different artist for the scenarios. The last two produced some great, high-quality art, the characters looked great. This artist isn’t as skilled. The characters are little more cheaply drawn and less detailed. It’s a shame because I think the last artist could have really captured Satoko and Keiichi’s relationship better. Still, this is a great series. The characters continue to be great, their personalities consistent (until things start going crazy). The clues to what is going on are scattered throughout, placed so well it’s only in hindsight that you can really make sense of the true story happening in the background. 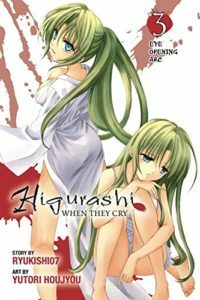 If you’re a fan of mystery and horror, Higurashi is one of the best manga (and properties) in the genre. You can’t go wrong with reading the original visual novels, playing the game, watch the anime, or read the manga, you can’t go wrong. You can buy Higurashi Curse Killing Arc 1 from Amazon. It’s the night of the Cotton Drifting Festival. Keiichi Maebara, newcomer to the village, wants to watch the ceremony, but Shion (twin sister of Keiichi’s friend Mion) wants to show him something. They find two individuals breaking into the sacred storeroom for the shrine. With everyone in the village watching the ceremony, it’s the perfect time to break in. Inside, Keiichi learns the dark past of Hinamizawa. A history of human torture of those who break the rules. For the last four years, the village has been punishing those who supported the dam project that would have seen village destroyed. This year, they’ll have to punish the four people who entered the sacred shrine. 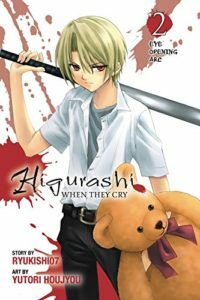 As Keiichi realizes just how bad the situation is when he learns that the two people who broke into the shrine with him and Shion have been murdered. Worse, other people whom Keiichi and Shion confided in have gone missing. It’s clear the secret leadership of Hinamizawa is cleaning house. How much longer before they come for Keiichi? While the first volume of this story is rather peaceful, things ramp up fast in here. Paranoia sets in and things get nuts. After the last volume, we saw that Mion and Rena were possessed by demons. It seems that same force is at work as we learn more about the history of the village. The tragedy plays out to the bitter end. The horror is intense. But it’s all so tragic. Once again, close friendships have ended in bloody murder. The culprit is different, but the results are just the same. There is something wrong with this village. What is the truth of what is going on? What will happen when the time resets for the next arc? As always, look for the things that stay the same. There are little clues for what is really going on. This arc, while tragic, is well done in what it’s purpose is. Ryukishio7 has created a scenario that serves to fuel the mystery. The art is great. I especially like the color drawings at the start. I like how they use different artists for the arcs, matching them up with the corresponding answer arc. 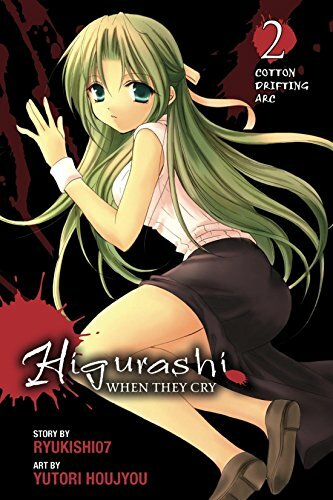 You can buy Higurashi Cotton Drifting Arc 2 from Amazon.